Another icy cocktail of heavy snow showers and biting winds arrived from the east again over the weekend during which we gained a new neighbour …..
….. who had arrived sometime during the bitterly cold weekend and who I photographed on Tuesday morning as its mother escorted it around the field alongside our house. 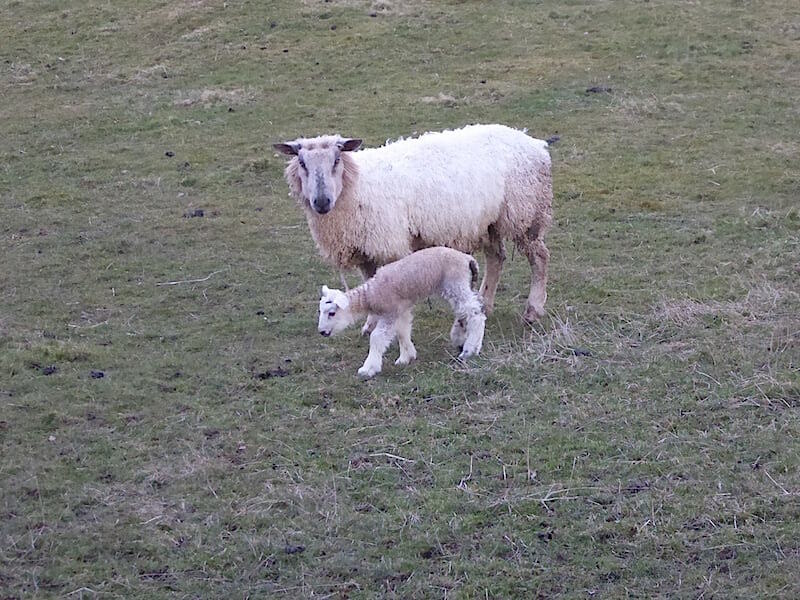 There are about a dozen pregnant ewes in the field and this was the first lamb to arrive. No human intervention or cosy lambing shed for this little creature’s birth, just its mother’s ability to give birth unaided and to keep it warm, fed and protected during the worst of weathers. Looks like she’s doing a grand job of it too, she was certainly giving me a very hard stare. The weekend came and went and so did the snow showers, the winds lessened and the temperatures crawled out of the minus zone. This morning was set to be sunny with a bit of a breeze but it would cloud over during the latter part of the morning and the wind would strengthen during the afternoon. That sounded very much like the forecast for our last walk, an experience we weren’t keen to repeat, but you can’t waste a fine morning so we stayed close to home, in the hope of hanging on to the fair weather for as long as possible, and took to the grassy moorland fells on the eastern side of Ullswater. No need to worry about finding somewhere to park along the farm access road rising out of the little hamlet of Helton, there’s space aplenty as you can see. 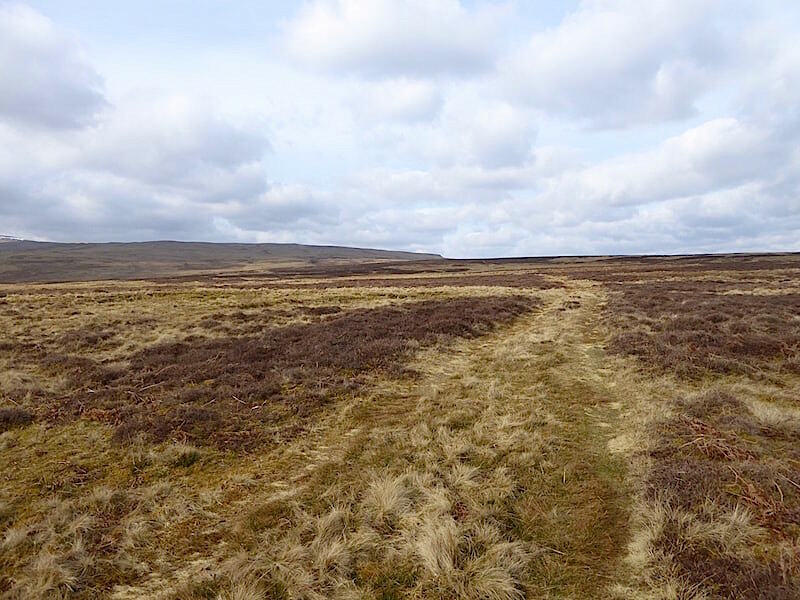 Its a fine dry morning, not exactly warm enough to do without a jacket, but definitely a whole lot warmer than it has been lately, so with just a bit of breeze blowing in our faces we start out along the firm dry path across the open moorland in the direction of Askham Fell. 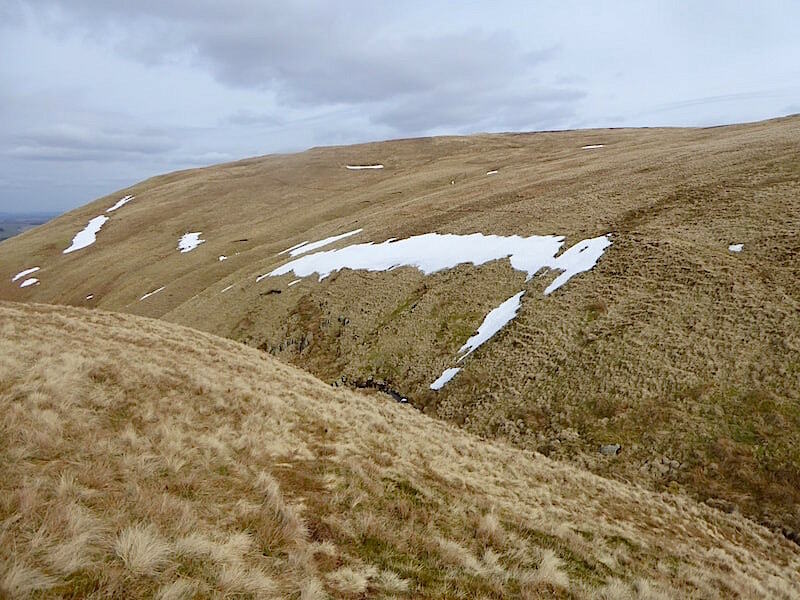 On the skyline Loadpot Hill is still hanging on to a ribbon of snow. 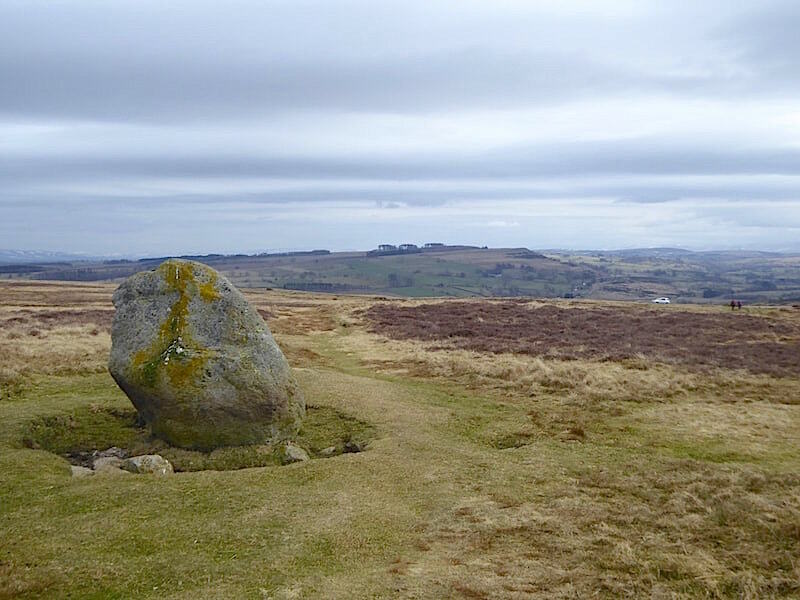 The path runs close by this glacial erratic known as the Cop Stone which, it is believed, once formed part of a Bronze Age ring cairn. 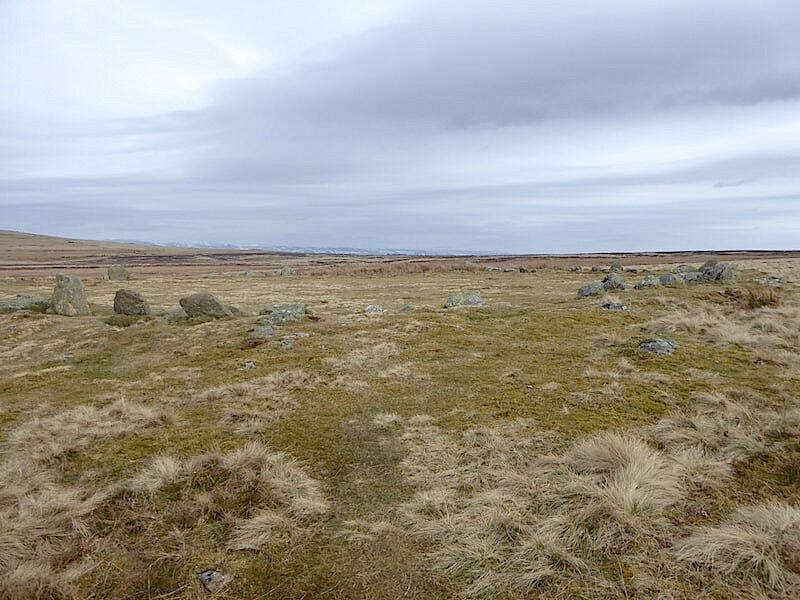 The whole area is dotted with all manner of structures with stone circles, standing stones and ring cairns being just some of the many examples of ancient stone monuments to be found across Moor Divock. 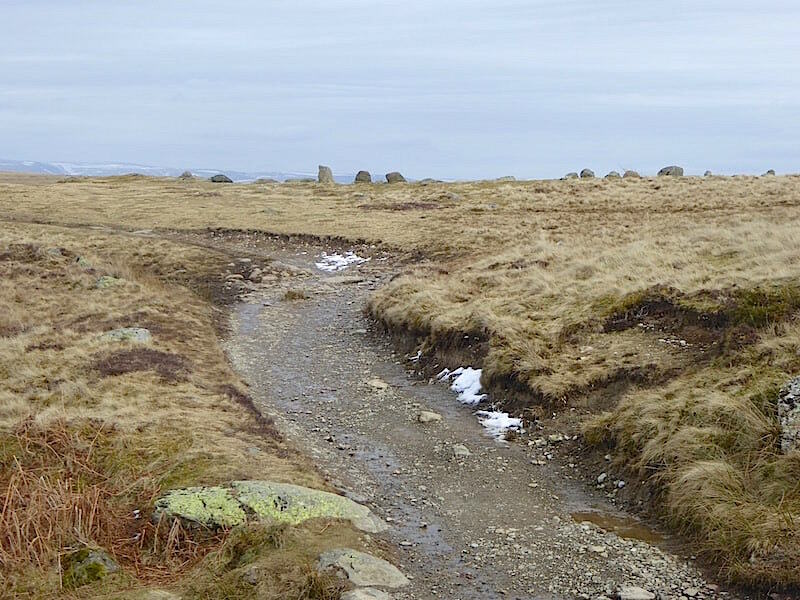 A little way beyond the Cop Stone we take a left turn off the main path and head off across Tarn Moor with acres of open land ahead of us. 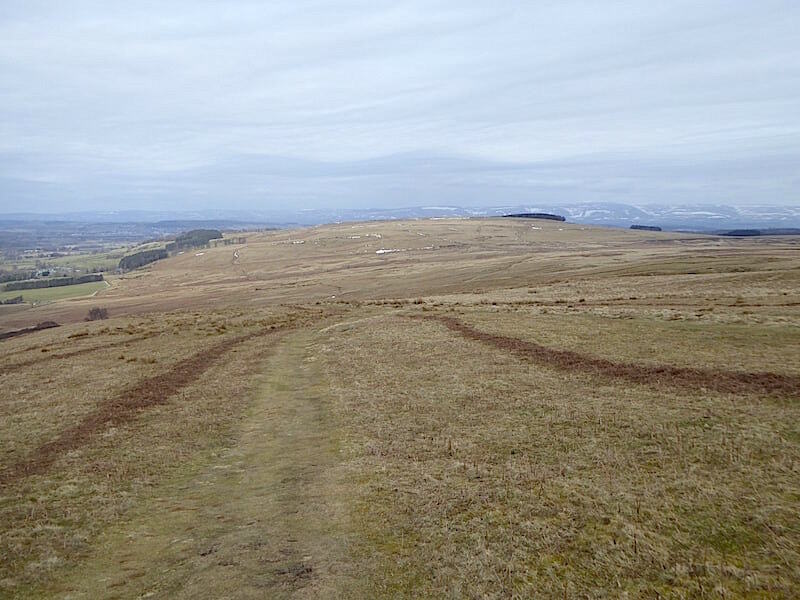 Its mainly grass, with patches of heather and dead bracken here and there, and can be very wet after prolonged periods of rain. Thanks to the recent frosts and the drying winds the ground was firm and largely dry and we were able to make good progress across it. 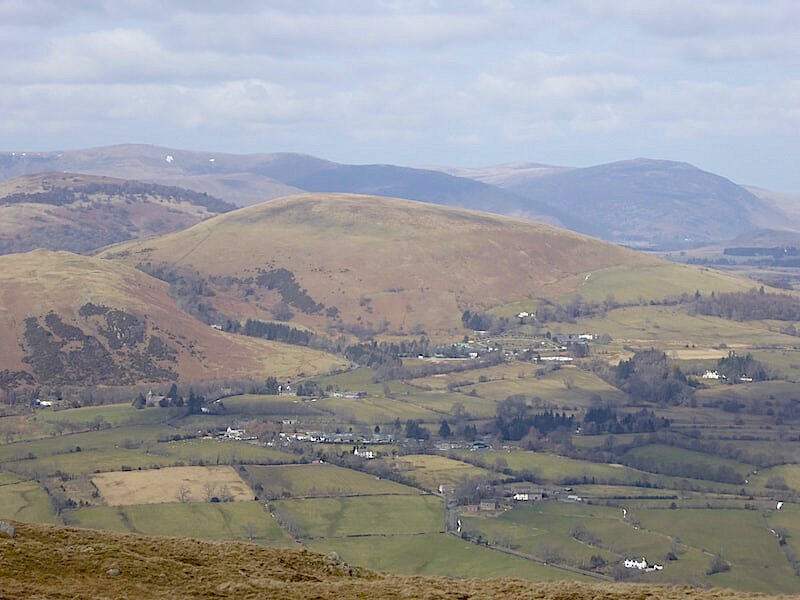 Over to the left is the long outline of Arthur’s Pike which will be the first summit on today’s walk. 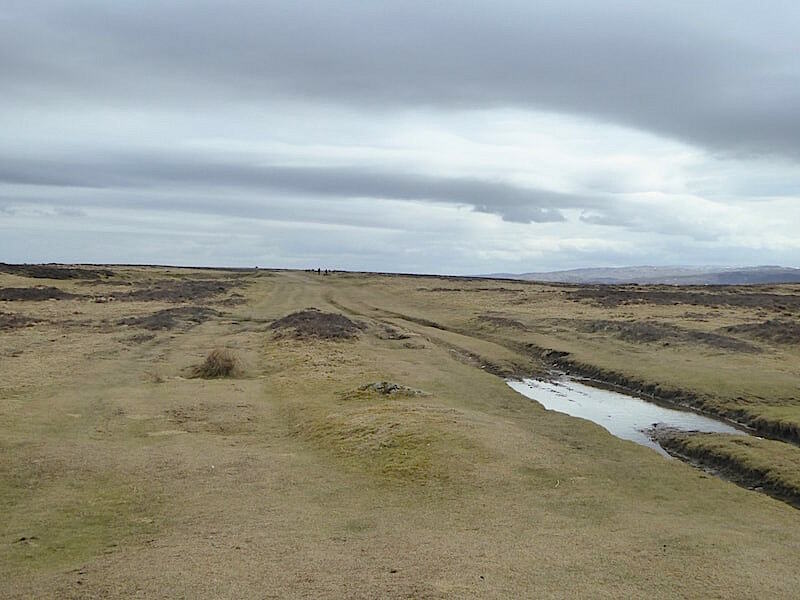 The path begins to turn towards the course of the old Roman Road but before we can set foot on it there is a patch of marshy ground to negotiate but with a bit of forward planning and some careful footwork we managed to avoid most of the wetness. 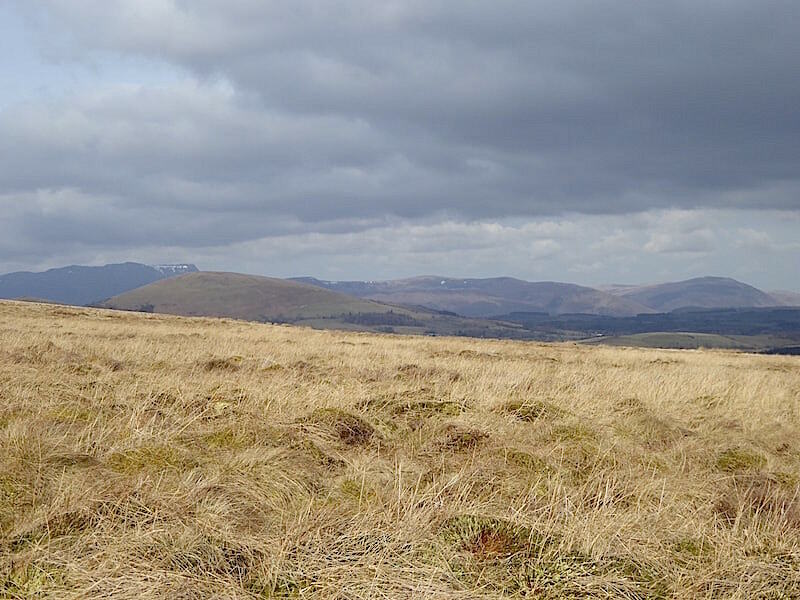 Safely across the marshy area with little more than a few splashes and on reaching firmer ground I took a look back towards Heughscar Hill. 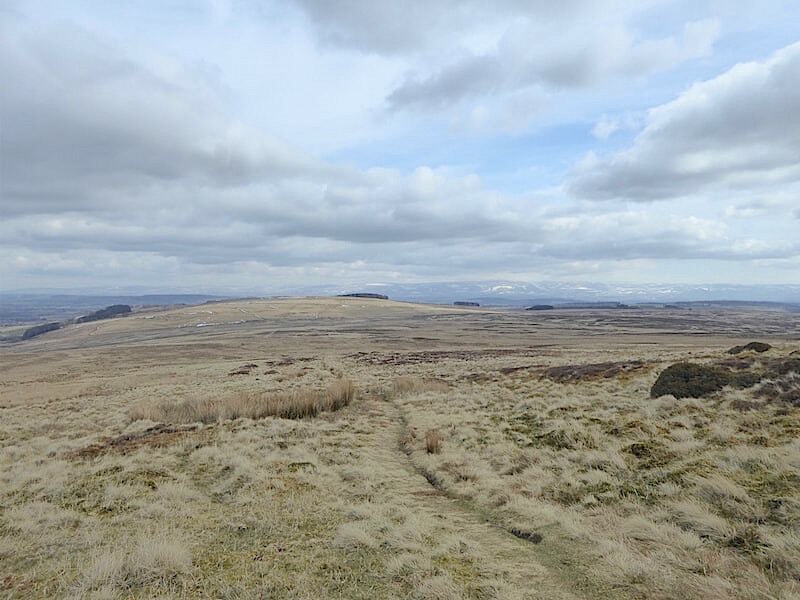 In the distance are the northern Pennines which once again were completely snow covered over the weekend. 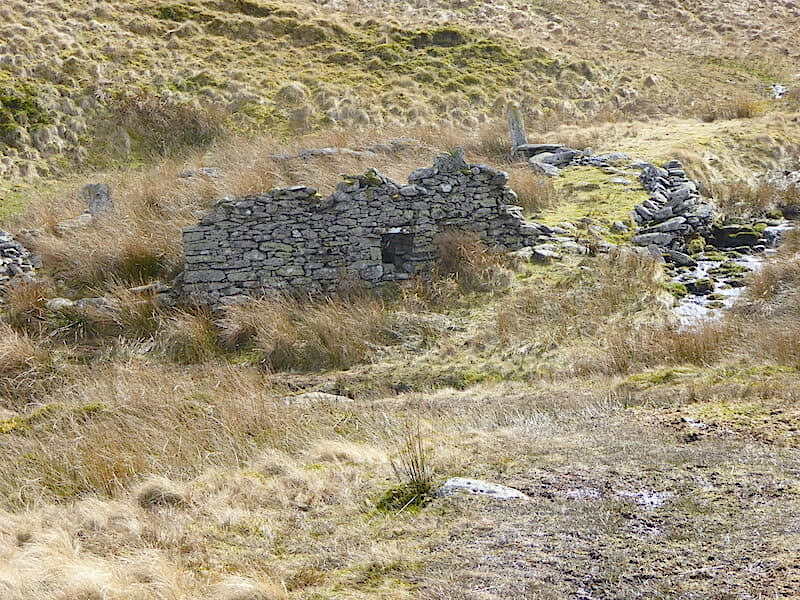 We didn’t turn onto the path in the shot but continued on across the bleached grasses to pick up the old Roman Road. 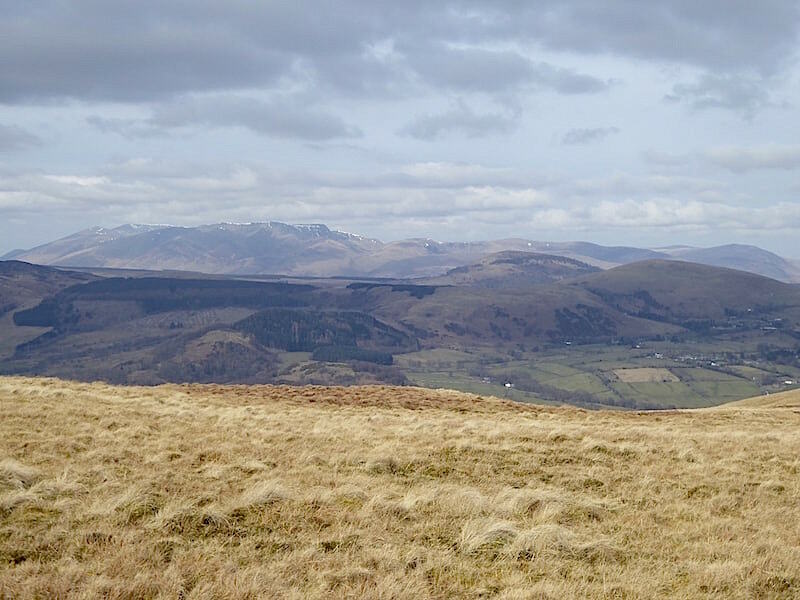 Ahead of us Blencathra and its northern neighbours begin to come into view beyond the humped back of Little Mell Fell. 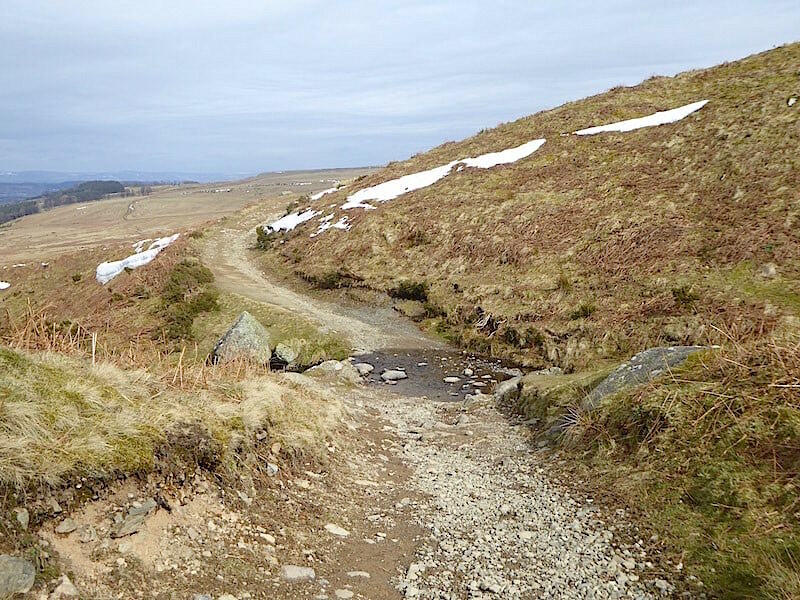 A look back towards Heughscar Hill as we reach the course of the old Roman Road and begin the long, steady climb up to Arthur’s Pike. 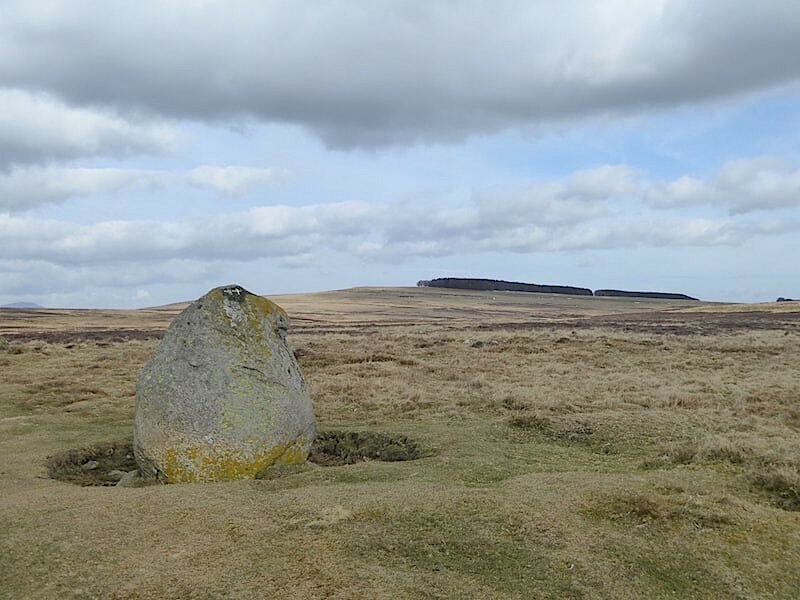 Alongside the path over Wartches is one of the many standing stone structures which are dotted around the whole area. 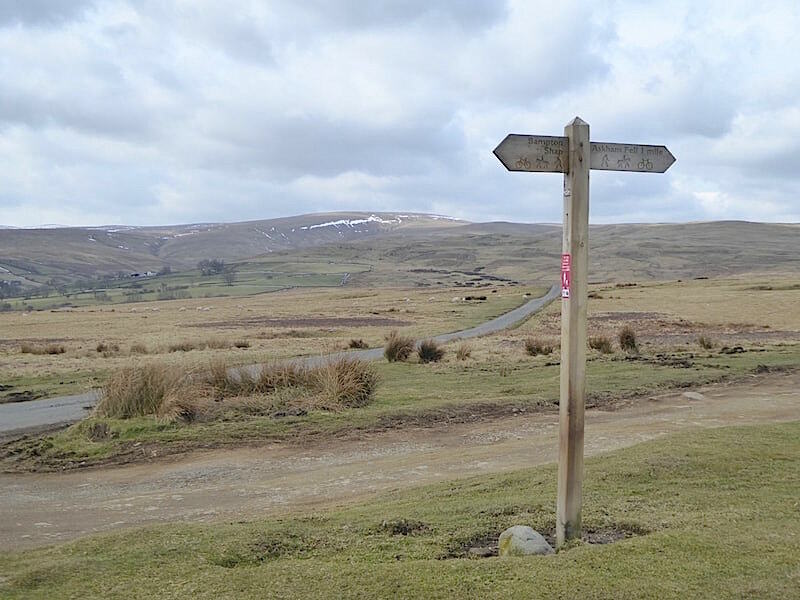 The OS map has it marked as a Boundary Post but it doesn’t have any markings which would identify it as such. 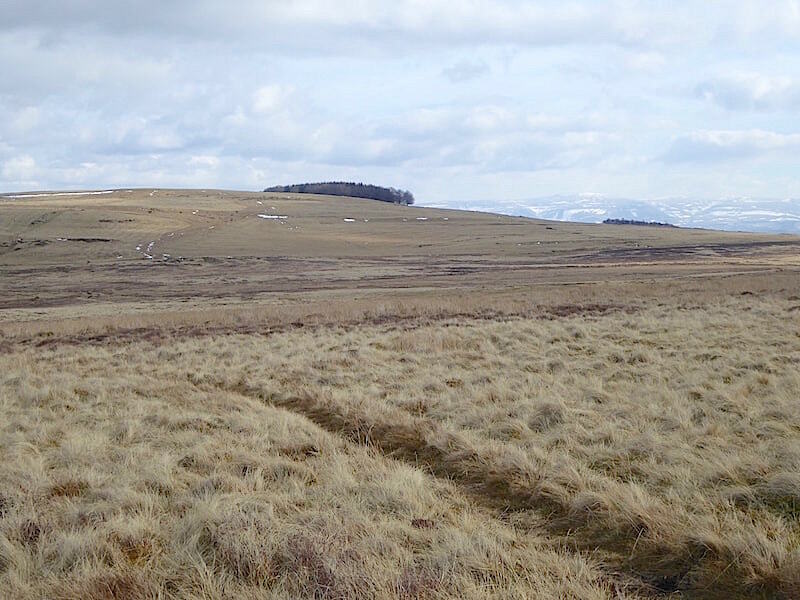 A look back towards Brown Rigg from the same spot. Nowhere on the path is excessively steep but the long, gradual rise provides a good workout nevertheless. 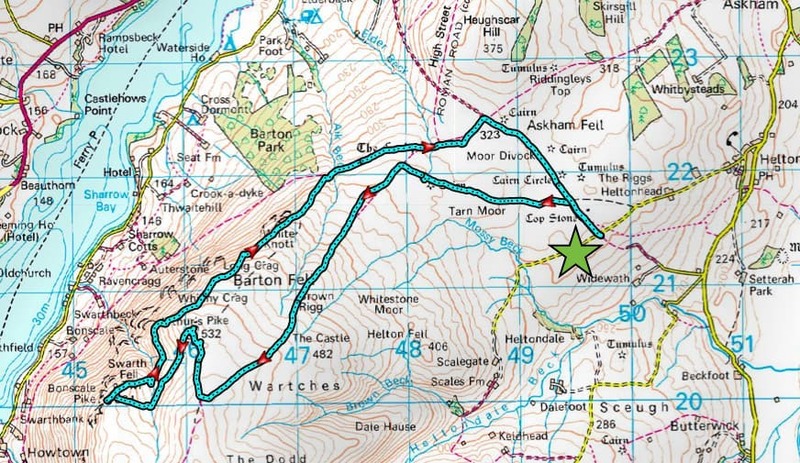 From here we could have turned off left and walked off path straight across to Arthur’s Pike. 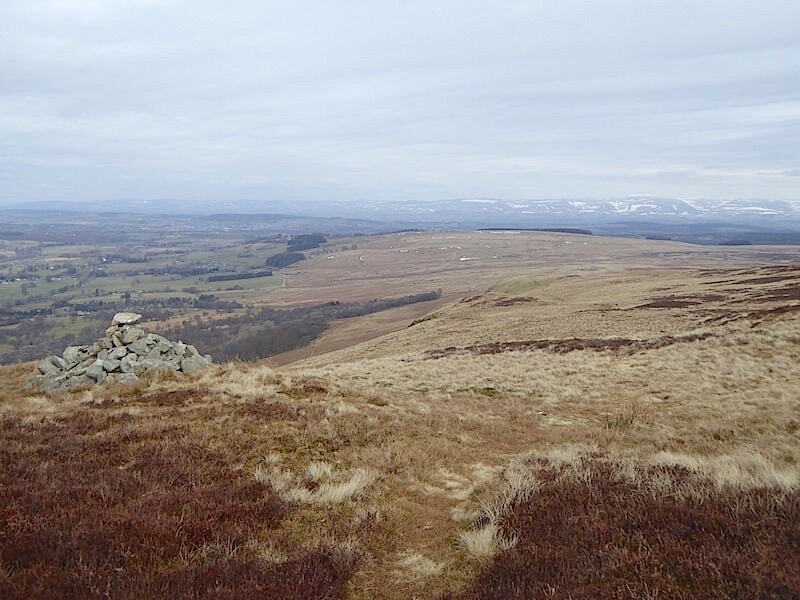 We kept to the path knowing that just a little further along it would meet the path between Arthur’s Pike and Loadpot Hill. 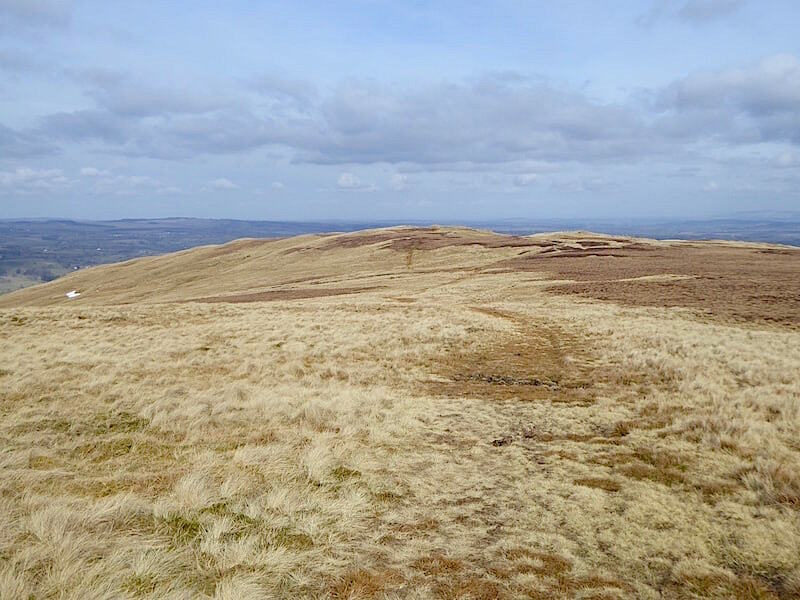 At that point it was just a case of doubling back along the path over to the summit of Arthur’s Pike. 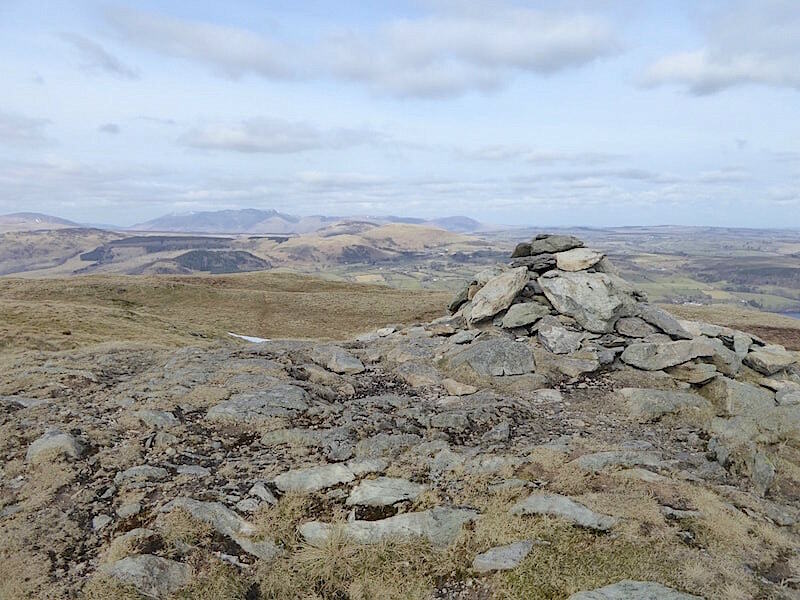 From the path over to the summit Blencathra and its neighbouring northern fells are occupying the skyline, with the two Mell Fells below them to the right. 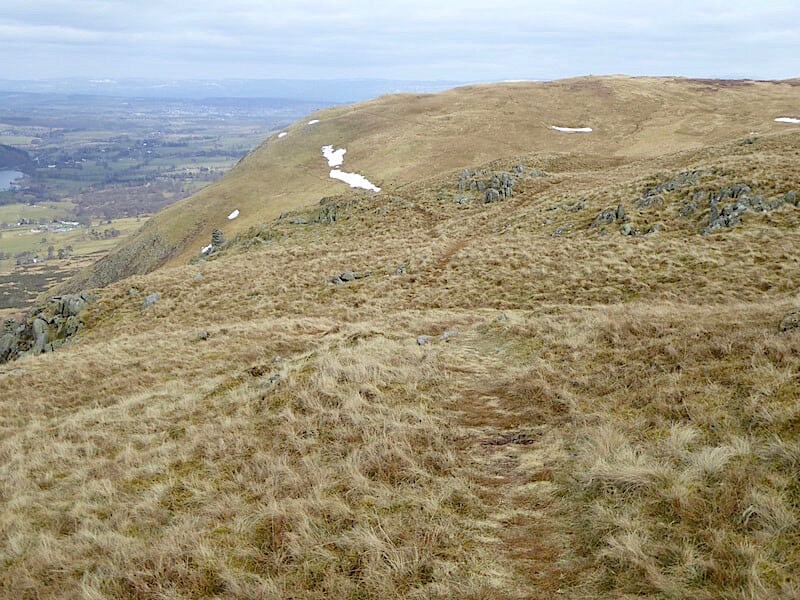 There’s no-one around at the summit when we reached it although we had seen two tiny figures up here as we were walking up to Brown Rigg. They were the only walkers we saw around here all day. It was much more blustery up here but thankfully nothing like the screaming winds we had on our last walk. It was enough to give us both a couple of ‘comb-overs’ but nothing more. 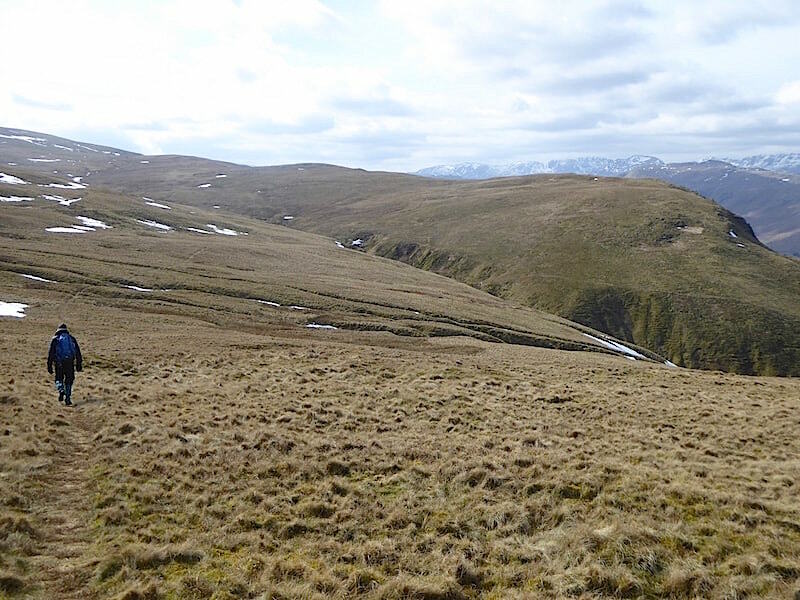 This shot is the view to the south west where there is still plenty of snow across the Helvellyn range. 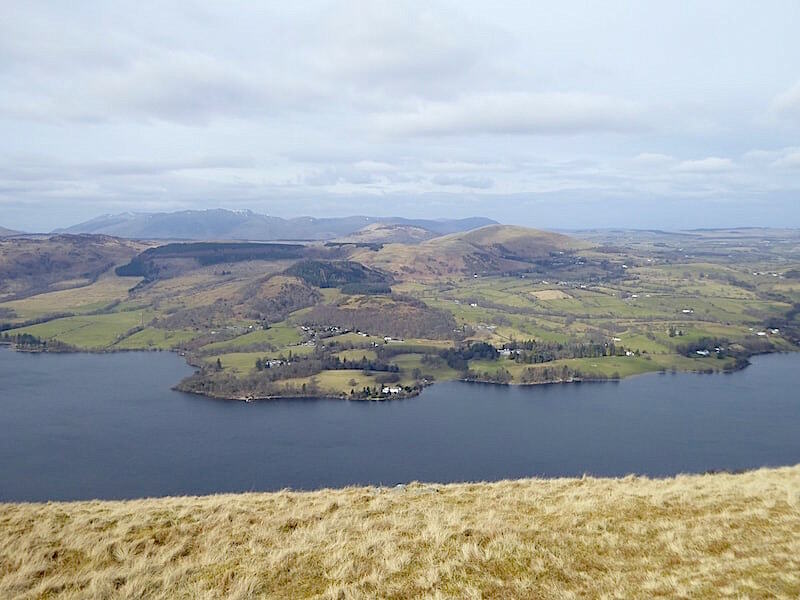 The view to the west with Blencathra and the northern fells on the skyline just to the left of centre …..
….. and the view to the north east together with a glimpse of the northern end of Ullswater. 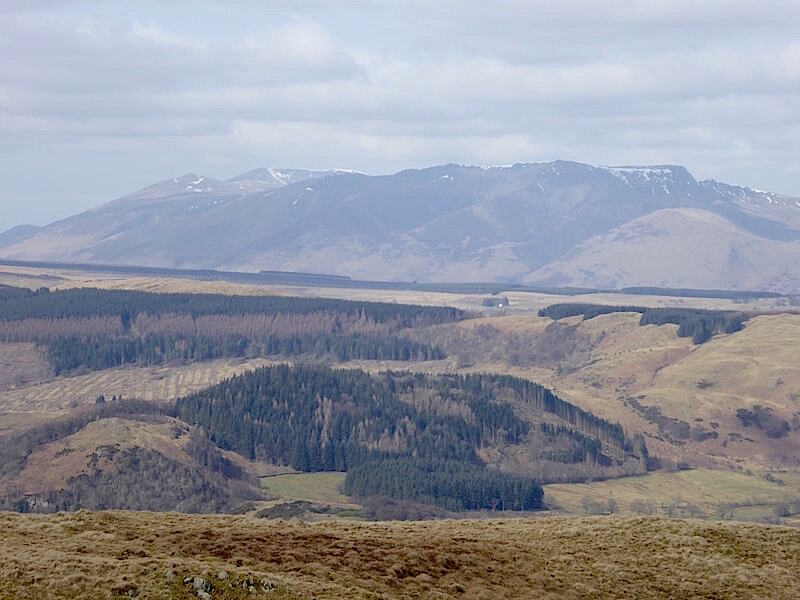 After a quick coffee stop we’re on the move again and heading over to Bonscale Pike with the eastern fells ahead of us and …..
….. Skiddaw and Blencathra, across Swinburn’s Park, over to our right …..
….. with Little Mell Fell taking centre stage just a little further to the right. 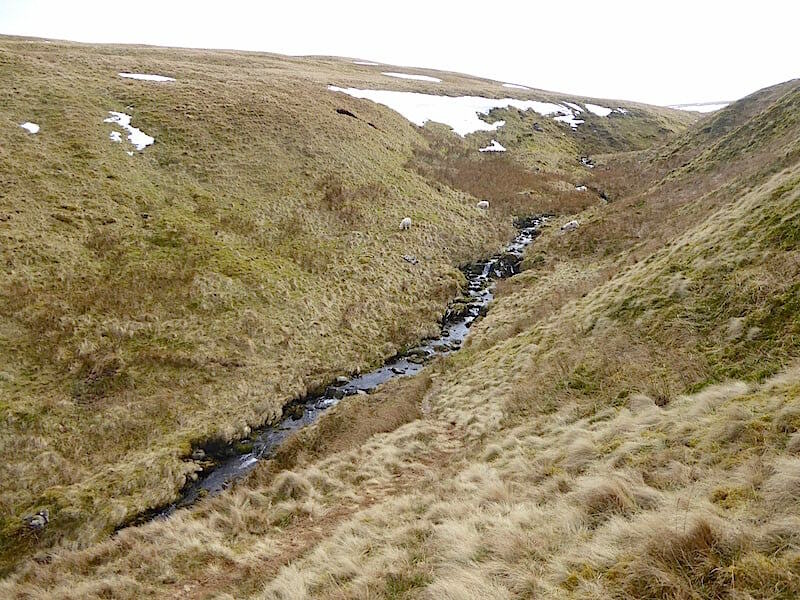 An enjoyable little tramp down to the Swarth Beck crossing …..
….. and the view to our right as we cross over. 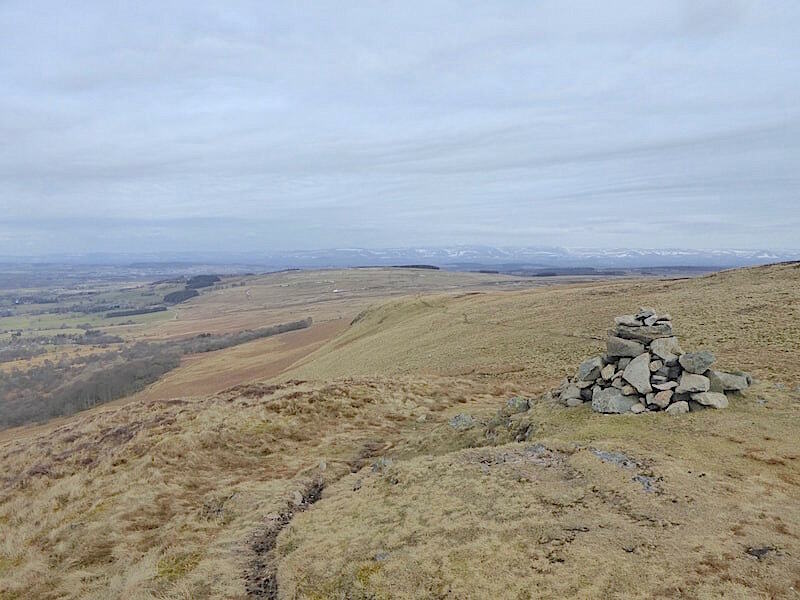 Bonscale Pike is the large green fell on the left. 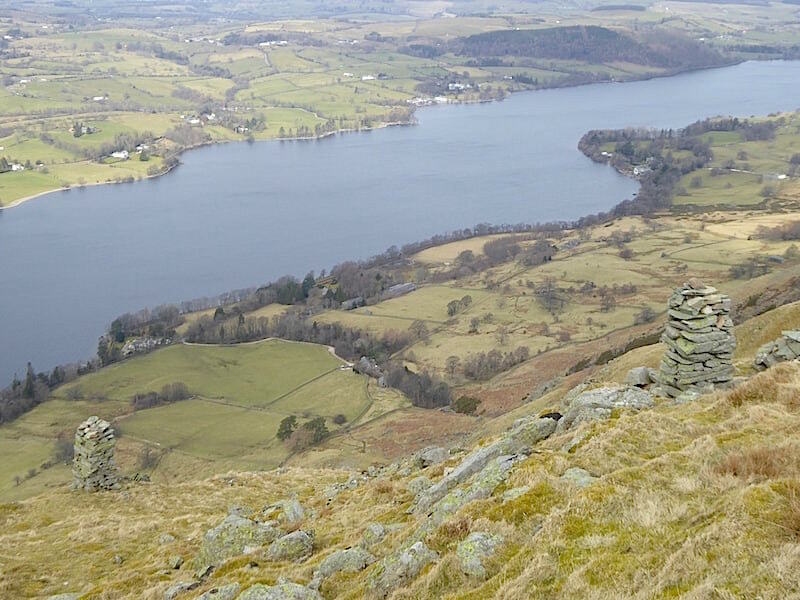 Another glimpse of Ullswater as we head over to Bonscale Pike. 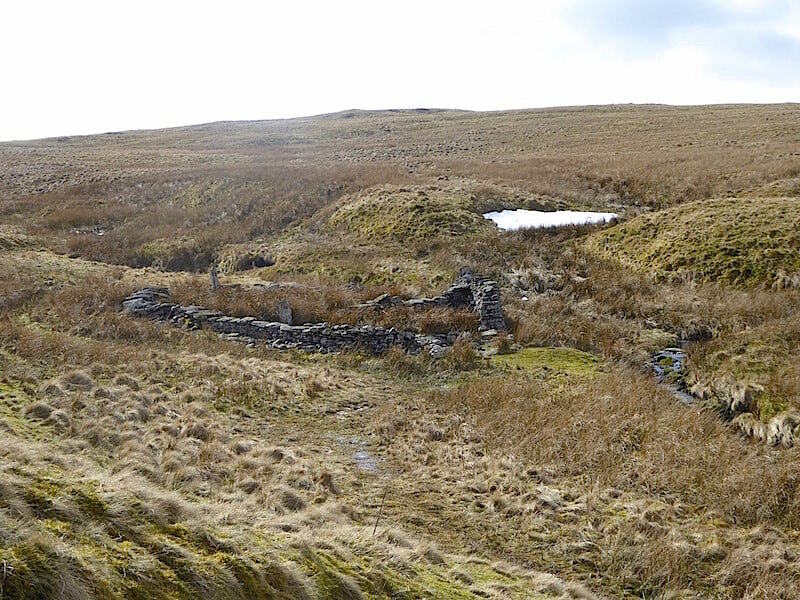 Down at Swarth Beck is a derelict building …..
….. which once may have served as a washfold given its proximity to the beck. 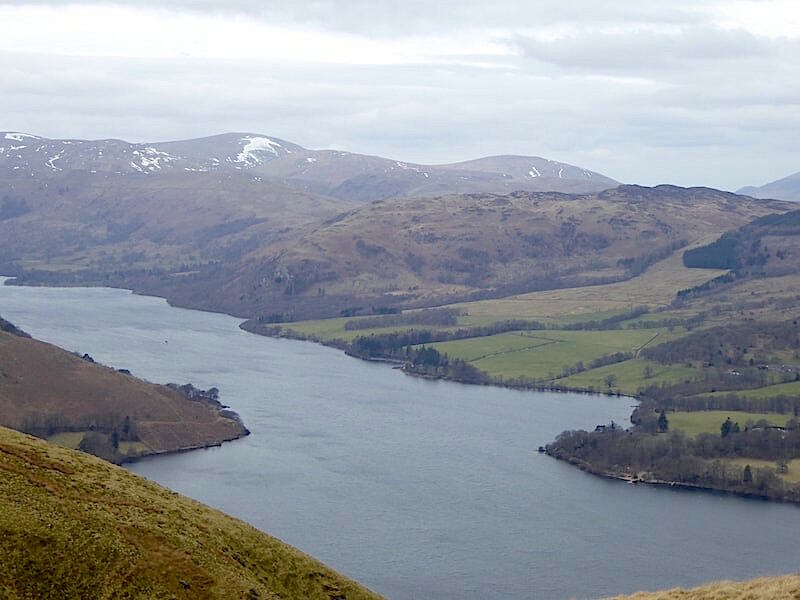 Having crossed Swarth Beck there’s a straightforward climb up to the top of Bonscale Pike with its extensive views of Ullswater and beyond. This shot looks towards the northern end of the water …..
….. and this one looks due west. 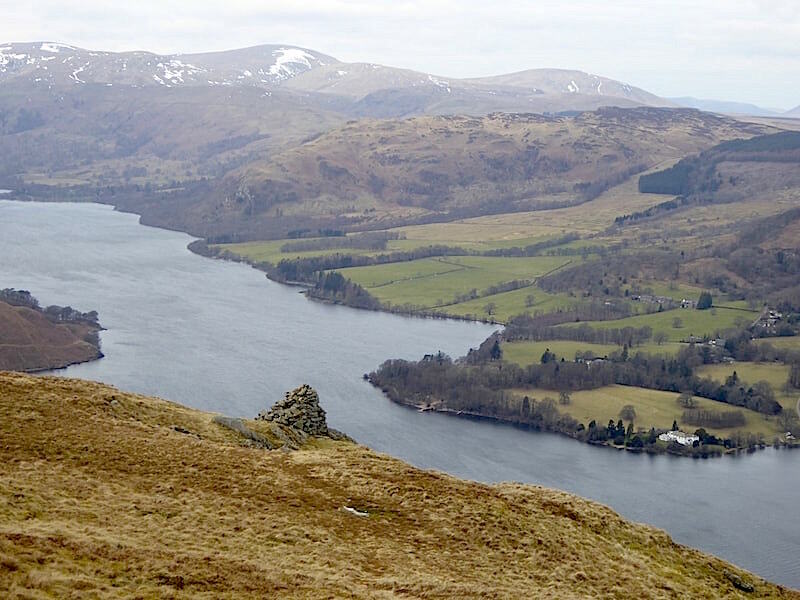 On the far side of Ullswater the little promontory with the white house at the water’s edge, is known as Skelly Neb. Apparently the skelly, or schelly, a member of the salmon family, lives only in deep cold water but they do come to shallow water to spawn. 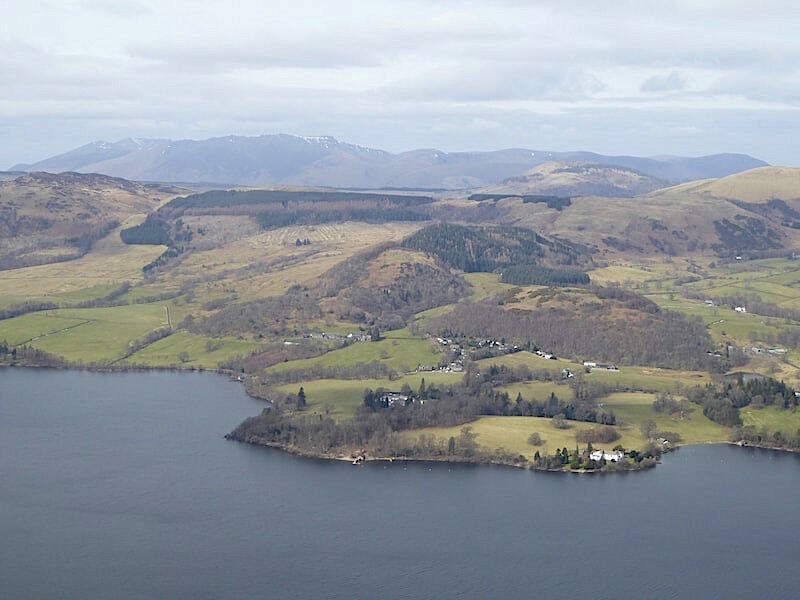 The species is only found in four lakes across England, all of which are in Cumbria, but they are rarely seen. 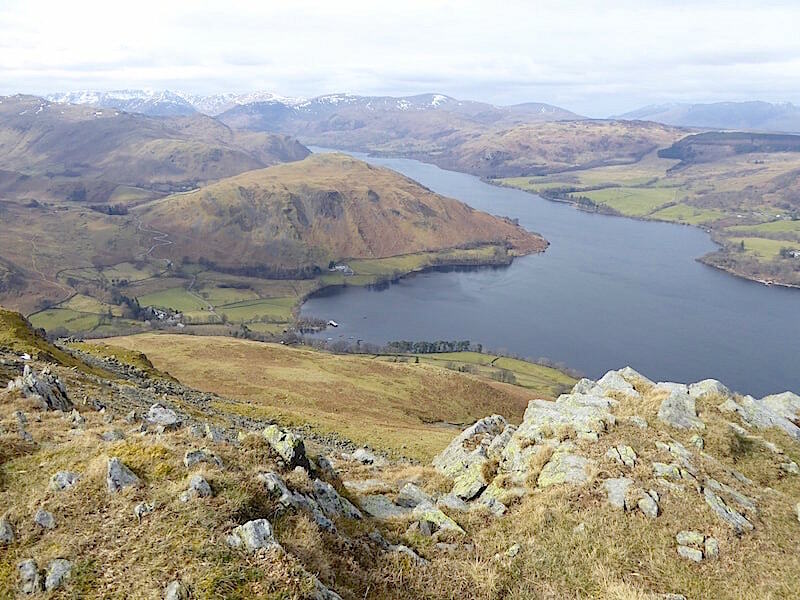 Numerous skelly bones, which are thought to have been left by otters, have been found around Skelly Nab and a few years ago one was found floating near the Glenridding pier. It seems that a couple of skellys are washed up every year but not in good enough condition for any tests to be carried out on them, the one found by the pier was very fresh and was taken away for further specialist examination. That’s probably a whole lot more than you needed to know about Skelly Neb, but anglers might be interested in knowing that the skelly is a protected species and don’t take the bait which anglers use. 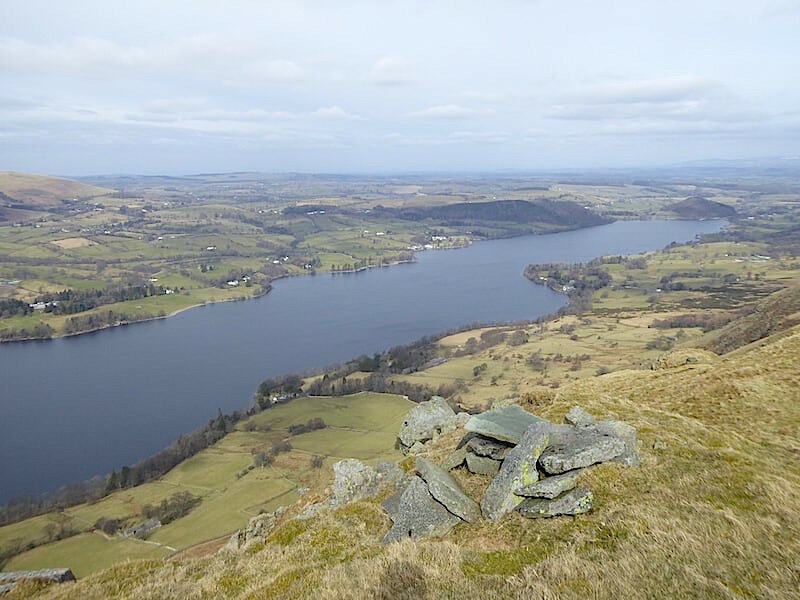 A grandstand view of Hallin Fell and the Howtown jetty immediately below us as we look south westwards along Ullswater …..
….. and a little further to the south a seemingly endless panorama of fells. 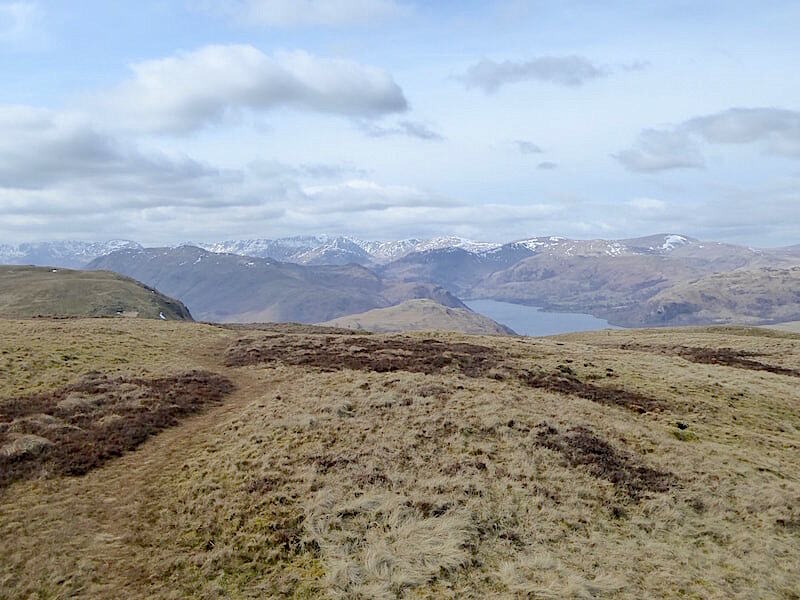 Far to many to name indiviually but immediately behind the slopes below us is Steel Knotts, behind that is Beda Fell and behind Beda is Place Fell. 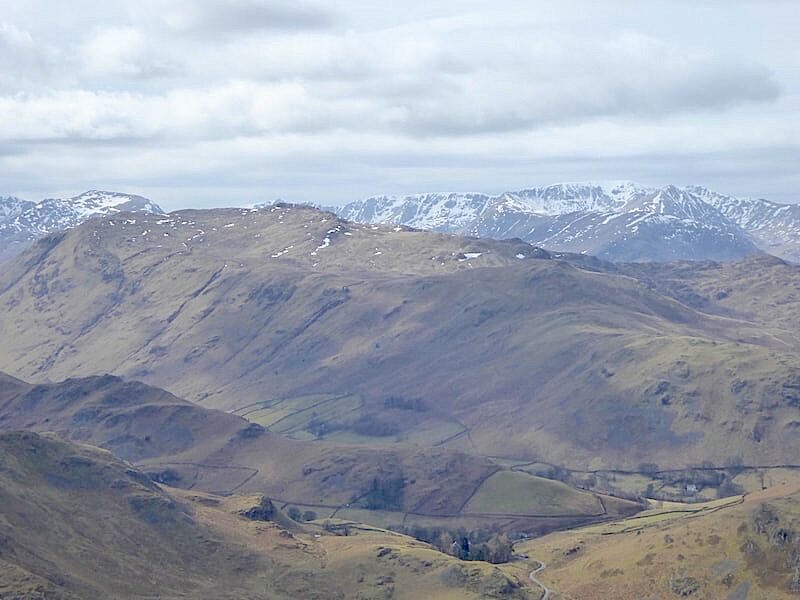 A closer look at Place Fell behind which is Saint Sunday Crag, over on the left, and the Helvellyn range on the right skyline. 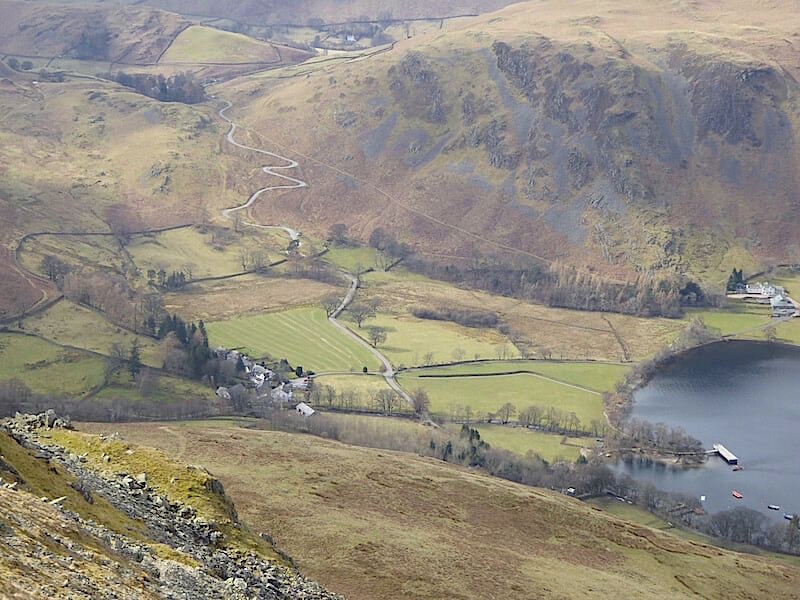 Another close up, this time of the Howtown hairpins leading up to the Hause between Hallin Fell and Steel Knotts. 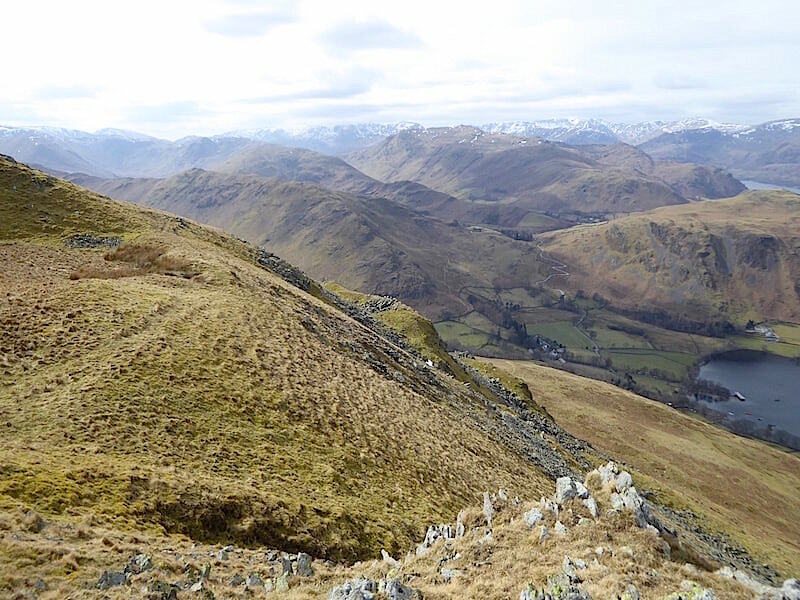 The hairpins look quite innocuous from up here, driving along them is a different matter altogether. 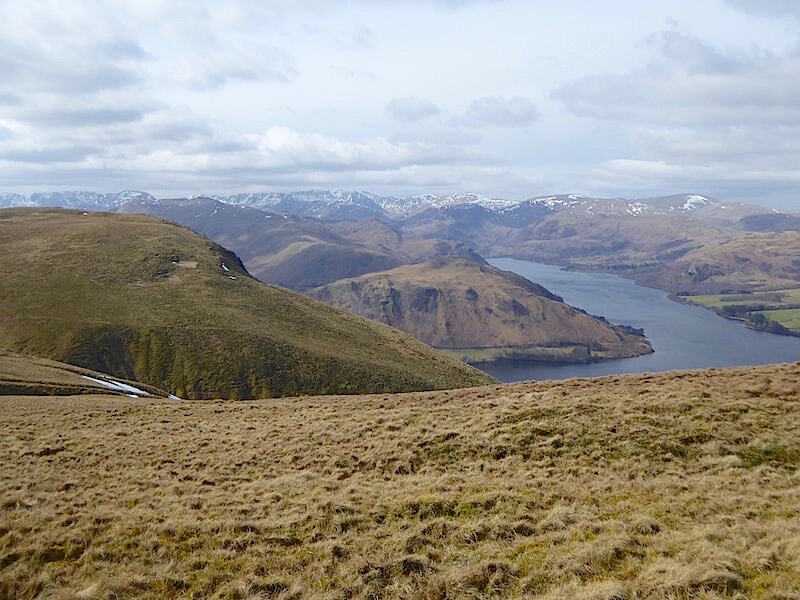 Looking along the northern arm of Ullswater from Bonscale Pike, during one of the sunny spells, with no-one else around. A splendid spot to linger for a few minutes. 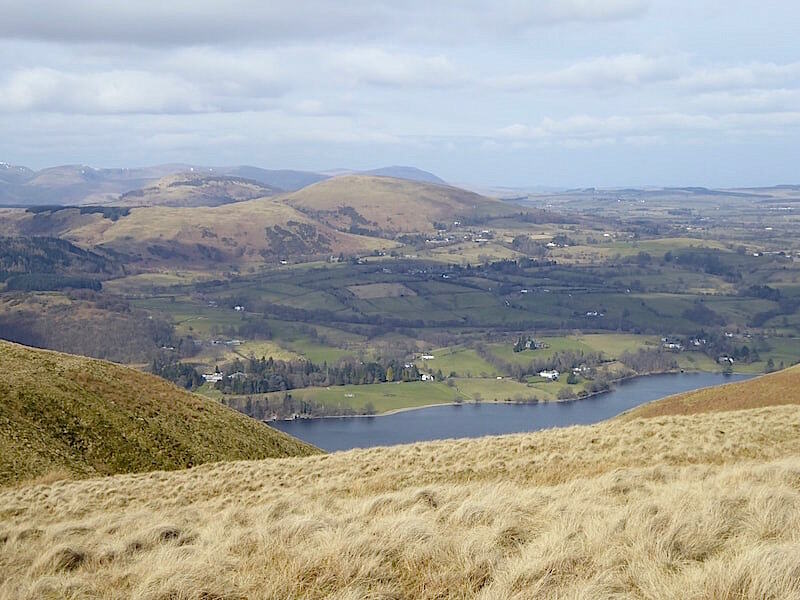 The Skelly Neb promontory again across the water, with the northern fells creating an extensive and impressive skyline all the way from Skiddaw on the left to Carrock Fell over on the right. 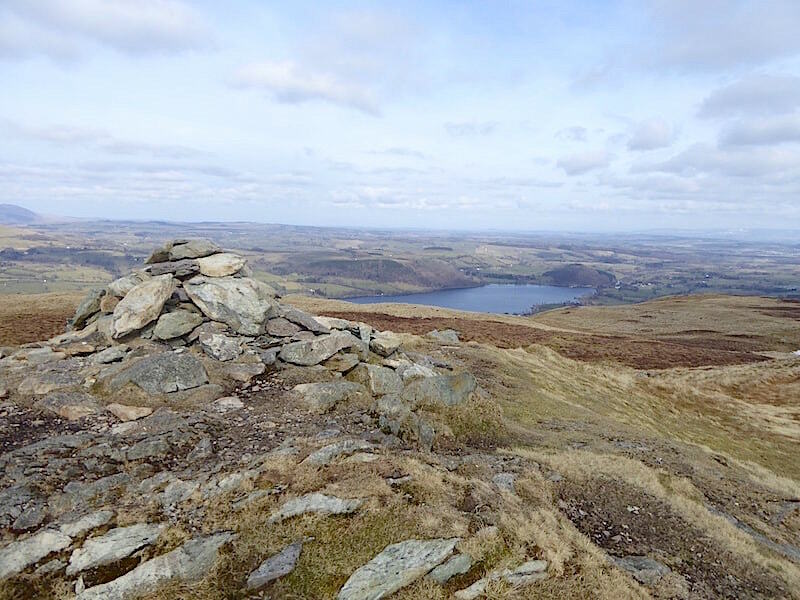 Having soaked up the views we leave Bonscale Pike and make our way back to Arthur’s Pike …..
….. with a view of the two columns on the steep slopes below us as we cross over. 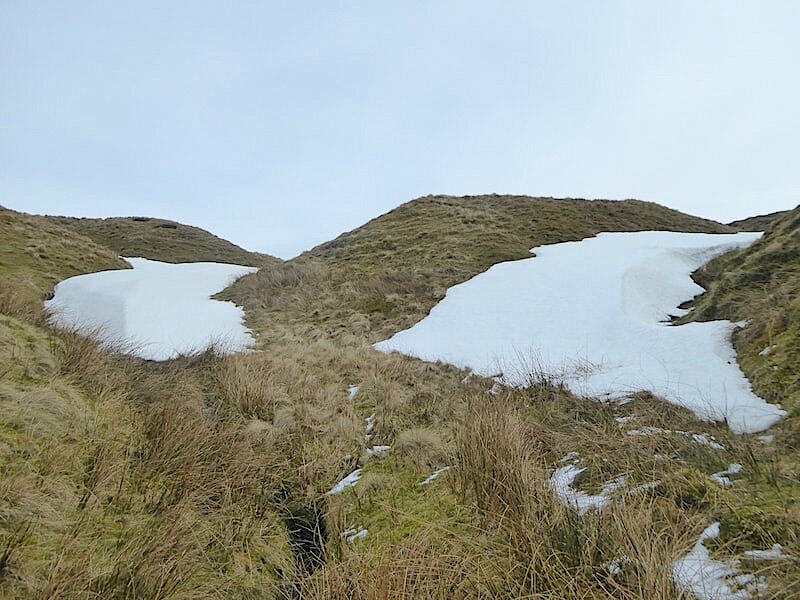 A view of Arthur’s Pike as we drop down to cross Swarth Beck …..
….. followed by a short clamber out again to regain the path. 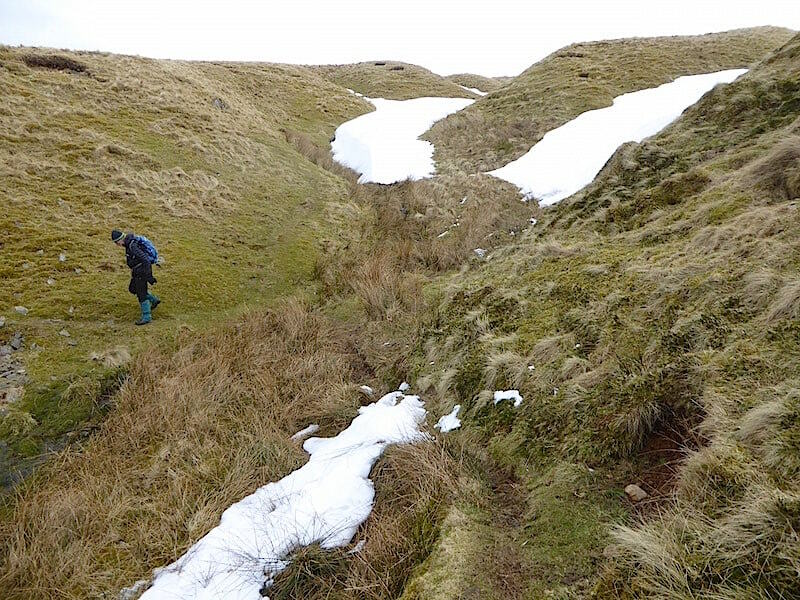 Crossing one of the little gullies beyond Swarth Beck …..
….. where some deep drifts are still reluctant to leave. 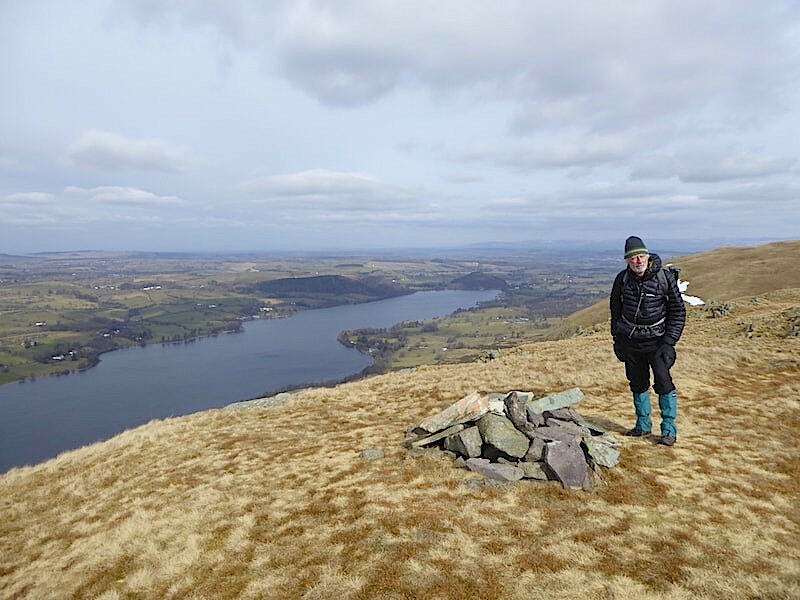 Looking back at Great Dodd and Clough Head on the skyline with the knobbly summit of Gowbarrow Fell over to the right …..
….. with the collapsed cairn perched dramatically below us and the summit cairn a little higher up behind me. 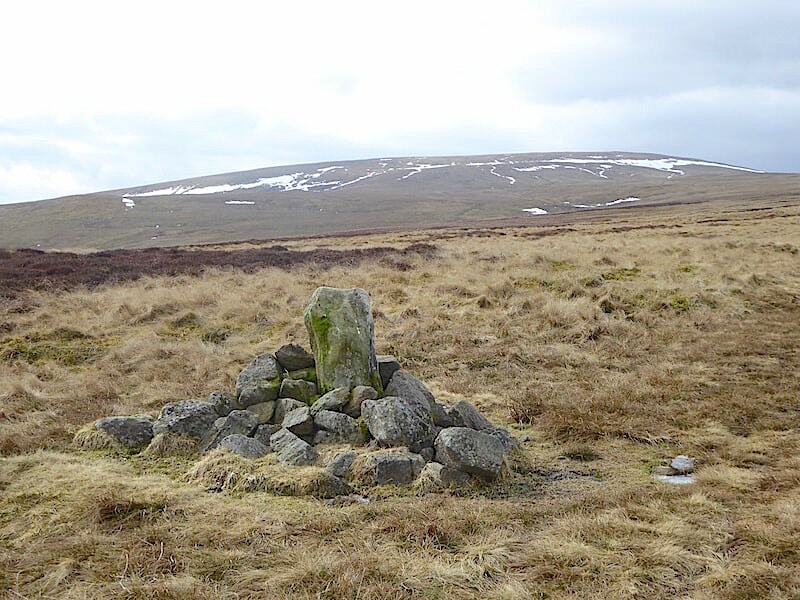 Dropping down from Arthur’s Pike and the summit cairn is soon left behind as we walk the path along the rim of Barton Fell. The predicted cloud cover is gathering pace behind us …..
….. as the sunny spells are pushed away to the east. 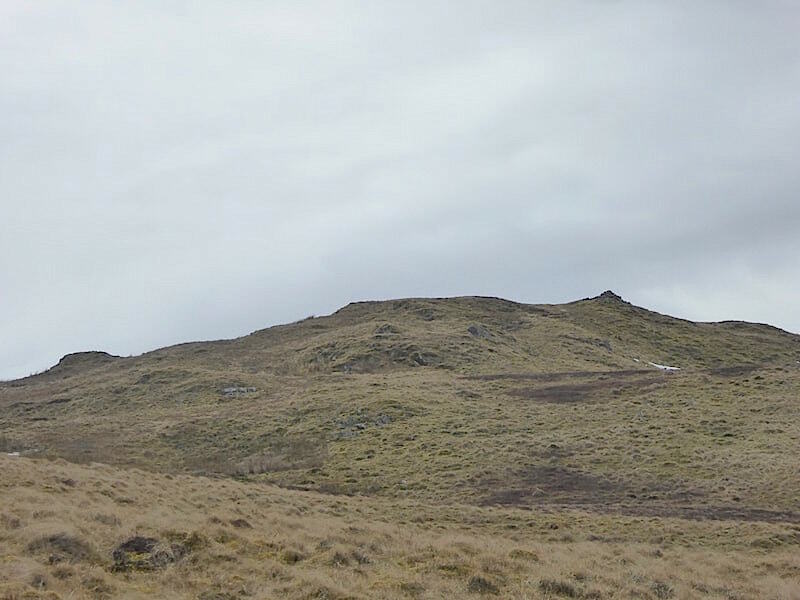 I think the marker cairn on the left is situated somewhere above Long Crag. 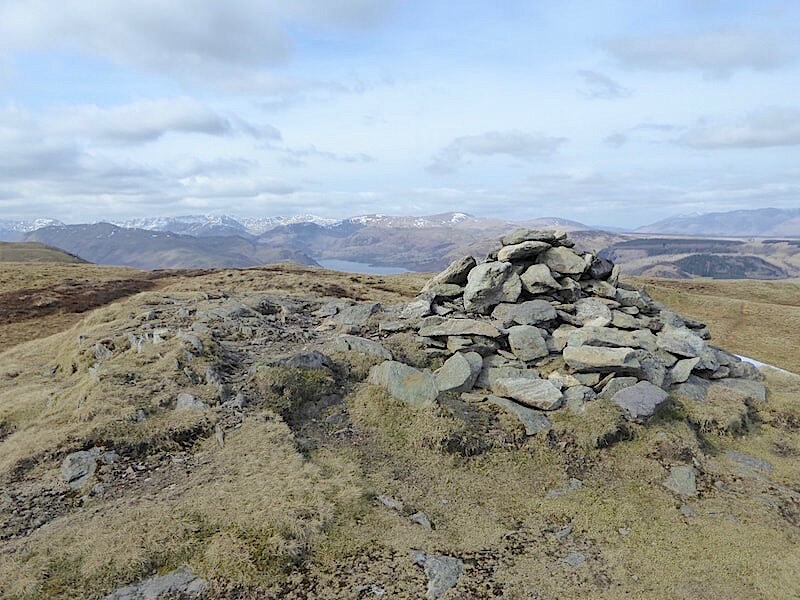 We round the cairn on White Knott and …..
….. follow the broad, grassy highway down to Aik Beck, a very enjoyable tramp with our boots tick-tocking rhythmically down the gentle gradient. 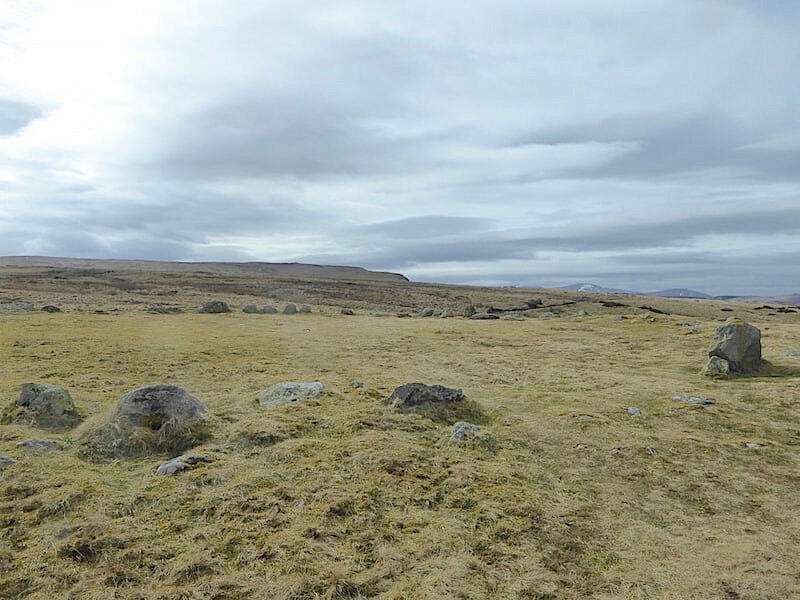 A couple of strides see us crossing Aik Beck and then its onwards to …..
….. the ancient stone circle known as The Cockpit …..
….. which is difficult to photograph well given that the stones are very low lying and the diameter of the circle is so wide …..
….. whichever angle you choose to shoot it from. 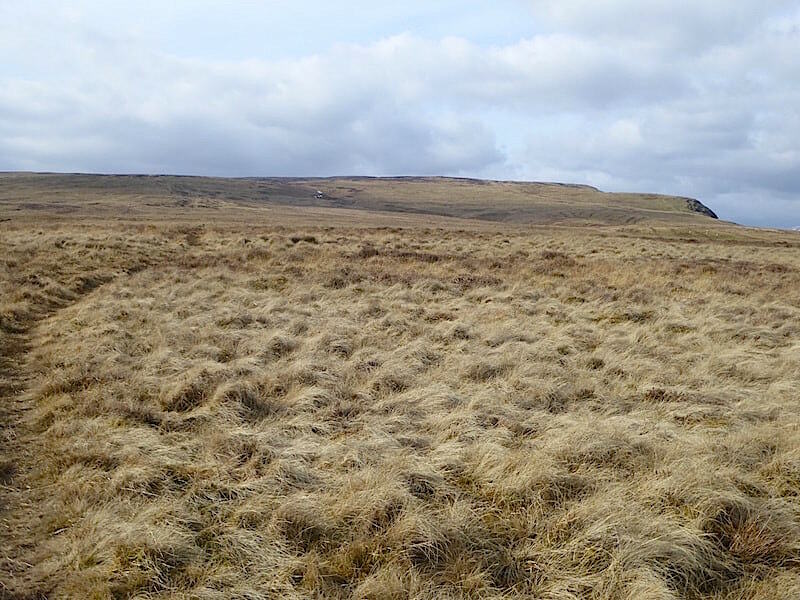 This view looks across the circle back towards Arthur’s Pike on the left skyline. The incoming cloud has caught up with us so this was almost the last sunny spell we had. The Cop Stone, and a couple of tiny figures, appear in the distance as we walk the last mile back to the car. Back at the Cop Stone again, with Knipe Scar on the centre skyline behind, and our car parked on the farm road just ahead of us. We haven’t taken a food stop this morning and its been a fair while since breakfast so now we’re both running on empty and our stomachs are letting us know about it. Nothing for it then but to have a picnic lunch in the comfort of the car. Life can be tough sometimes. 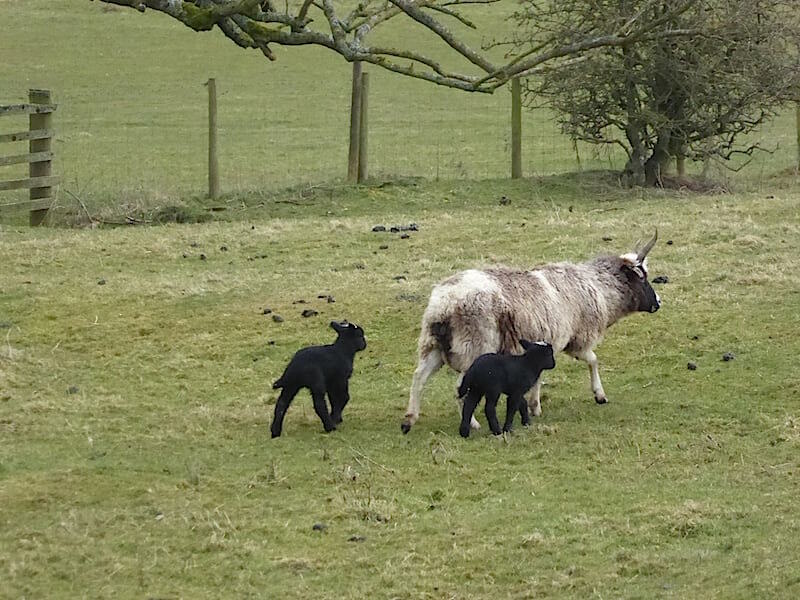 Update – Over the last couple of days the first born lamb has acquired some new playmates. 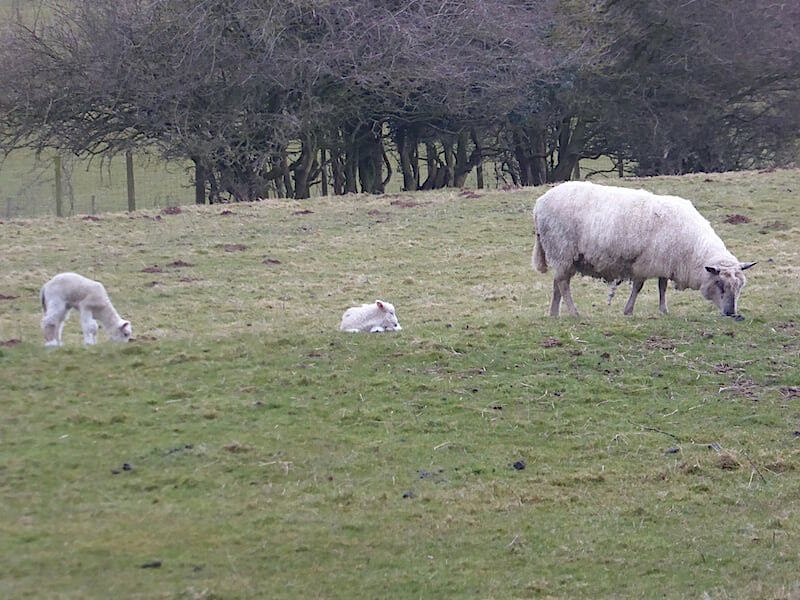 The ewe in the shot below had black triplets but as she can’t feed three the farmer has taken the smallest of them back to the farm for hand rearing.